A couple of weeks ago I wrote about GPMDP, a Google Play Music desktop application that integrates Google Play Music with the desktop and adds various features on top. If you don't need all those desktop features and all you need is a lightweight, console Google Play Music client, you can try Jam. 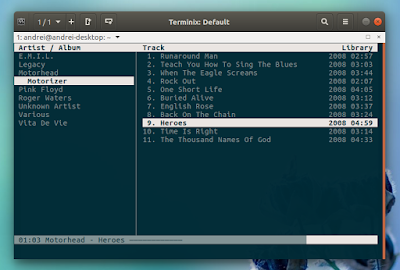 Jam is a new Google Play Music console player for Linux and Windows. The application, which is written in Go, had its first alpha release about two weeks ago, and it's currently at version 0.4.0.
populates a local database with the artists and albums you saved through the web interface (or by any other means) and allows searching artists in this database. Jam is still very new, so it lacks a few features, but its developer hopes to improve it further, by making its interface detachable like MOC or to allow controlling the playback via command line arguments. If there's some feature you'd like to see in Jam, you can submit a bug report. It's important to mention for Jam to work, you need to login using the same account used for Google Music on your mobile device. Without this, you will get a "no valid devices" error when trying to login with Jam. If you use the Google two-factor authentication, you'll need to generate an app password for Jam. You can do this by visiting THIS link. Note: the instructions below were tested on Ubuntu 16.04+ / Linux Mint 18.x and may not work on older Ubuntu versions (golang-go may be too old).